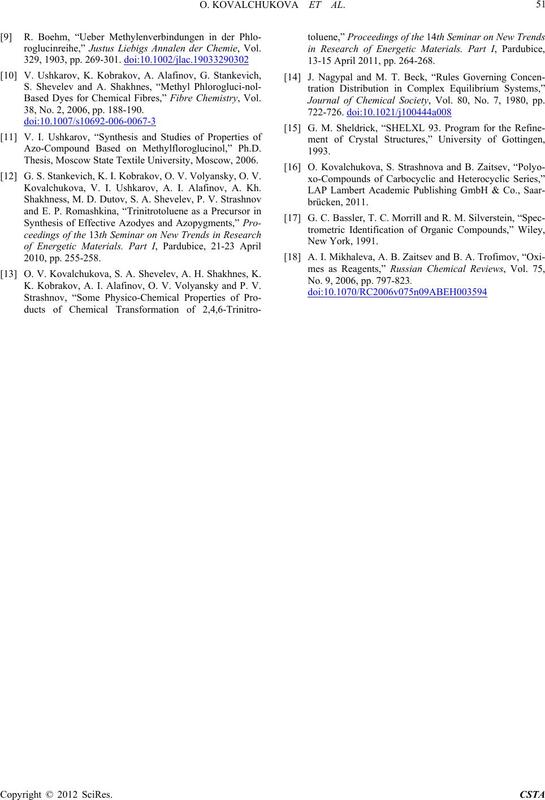 tautomerism while ionization of I.
oped, it practically has not been realized. presence of sulfuric acid . duct of the reaction of MPG nitrosation. 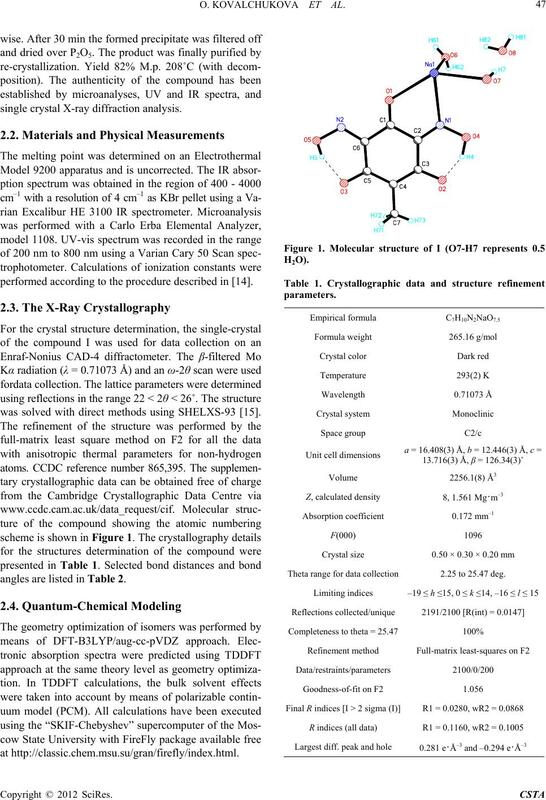 single crystal X-ray diffraction analysis. performed according to the procedure described in . was solved with direct methods using SHELXS-93 . angles are listed in Table 2. Theta range for data collection2.25 to 25.47 deg. Table 2. Selected bond lengths (Å) and angle s (˚). C2/c with Z = 1. (1.292(2) Å) are close to the corresponding double bonds. series were reviewed in . Table 3. Hydrogen bonds in I (Å and deg. ). –z #6 x, y – 1, z. Figure 2. Fragment of the crystal structure of I. 3.65 and 3.80, %N: 10.24 and 10.56. (m) cm–1 characterize the C…C and C…N vibrations. 329.08 nm (logε 4.25) appears. were performed by the TDDFT method. di- (d) and trianionic (e) forms. tautomer of I in a neutral (a) and monoanionic (c ) for ms.
tautomer of I (b) and its trianionic (e) form. sorption occurs at 329.08 nm (logε 4.25). 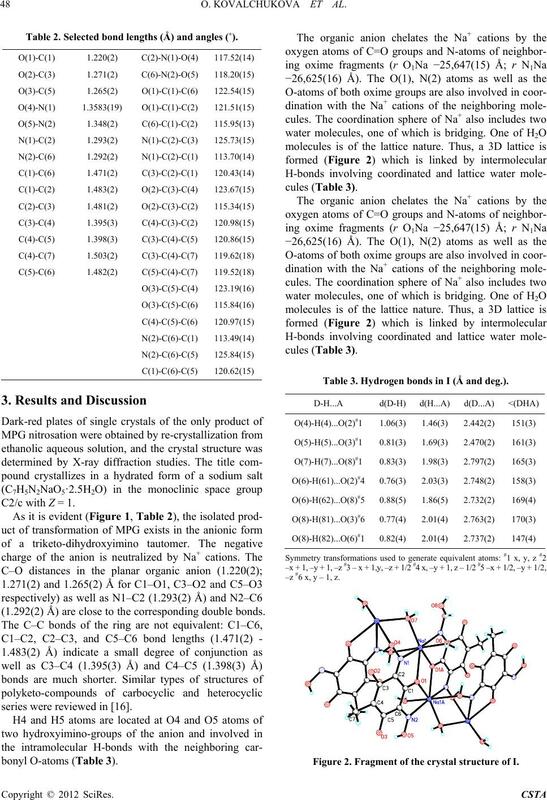 phenols,” The Journal of Organic Chemistry, Vol. 51, No. S. A. Shevelev, A. Kh. Shakhnes, B. J. Ugrak and S. S.
Vol. 37, No. 17, 2001, pp. 2557-2561.
neol,” Journal of Chemical Society, 1933, pp. 714-720. F. M. Dean and A. Robertson, “Usnic Acid. Part VIII. 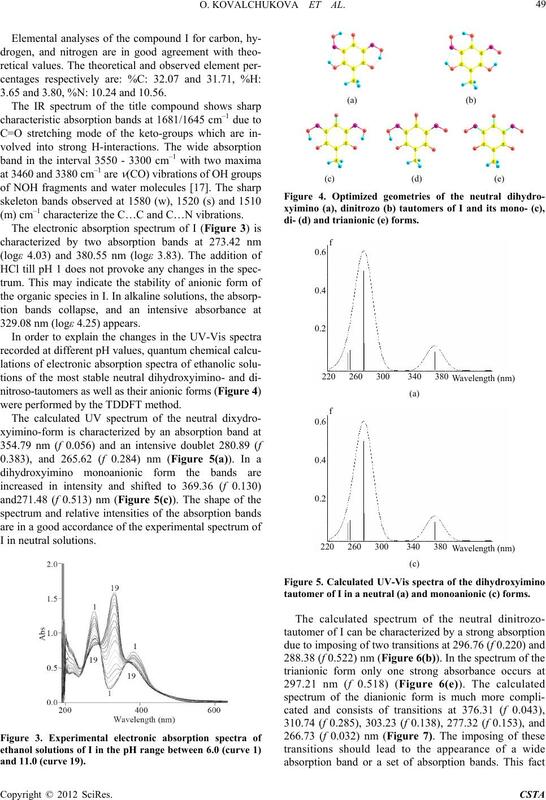 phloroglucinol,” Journal of Chemical Society, 1953, pp. Acta, Vol. 2, No. 1, 1919, pp. 466-481.
roglucinreihe,” Justus Liebigs Annalen der Chemie, Vol. 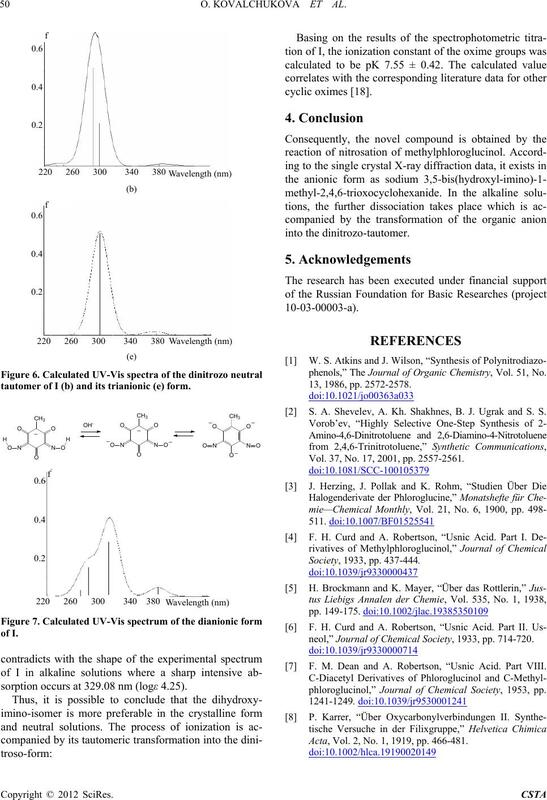 Based Dyes for Chemical Fibres,” Fibre Chemistry, Vol. 38, No. 2, 2006, pp. 188-190. Azo-Compound Based on Methylfloroglucinol,” Ph.D.
Thesis, Moscow State Textile University, Moscow, 2006. G. S. Stankevich, K. I. Kobrakov, O. V. Volyansky, O. V.
Kovalchukova, V. I. Ushkarov, A. I. Alafinov, A. Kh. O. V. Kovalchukova, S. A. Shevelev, A. H. Shakhnes, K.
K. Kobrakov, A. I. Alafinov, O. V. Volyansky and P. V.
13-15 April 2011, pp. 264-268. 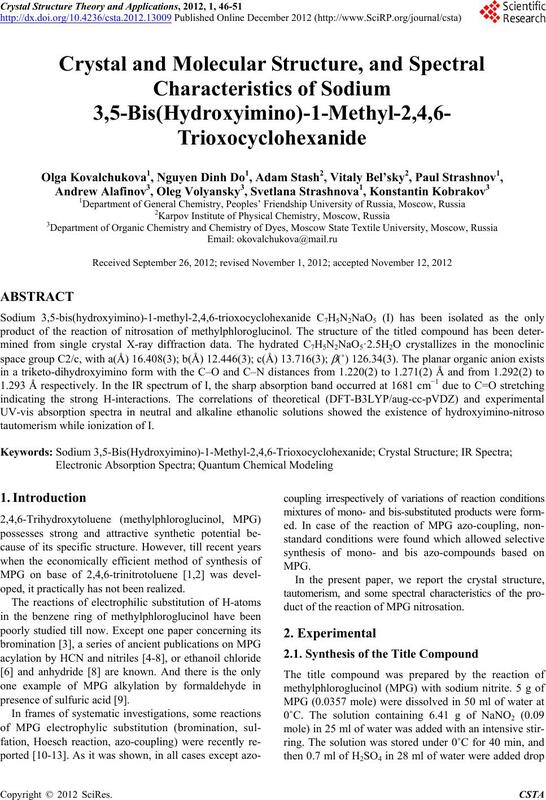 Journal of Chemical Society, Vol. 80, No. 7, 1980, pp. A. I. Mikhaleva, A. B. No. 9, 2006, pp. 797-823.